If you’re in the business of creating screencasts or Mac-based video demos, there’s a very good chance that you’re already using Telestream’s $99 ScreenFlow. With the latest update, the app is sure to gain a new group of supporters—iOS developers. And it will because Apple is encouraging these developers to submit app previews—video captures of their apps in action. It happens that this latest version of ScreenFlow not only lets you capture video directly to a Mac running Yosemite from an iOS 8 device that bears a Lightning-connector, but also lets you add touch callouts—overlays that mimic finger taps and swipes. Like every version of ScreenFlow I’ve ever used, it exhibits quirky behavior from time to time, but the app’s benefits vastly outweigh its quirks. If this is the first you’ve heard of ScreenFlow, here’s the lowdown. ScreenFlow is both a motion-capture tool as well as a video editor. Unlike some other capture utilities, it doesn’t allow you to capture just a portion of your screen—it’s all or nothing. When you wish to show just a bit of the screen you turn to its editing tools once you’ve completed your capture. They allow you to zoom in and out on the screen as well as add callouts, titles, annotations, transitions, and video and audio actions. ScreenFlow is not a Final Cut Pro or Adobe Premiere replacement. Although you can edit video very easily once you get the hang of the workflow, it doesn’t offer much in the way of video effects and its titling functions aren’t terribly advanced. While you can use it to edit camera footage (and I often do), it really shines when working with the kind of material you’d use in a screencast. With that under your belt, let’s examine its new features. With iOS 8 and Mac OS X Yosemite, Apple introduced the ability to capture video and audio from a connected Lightning-bearing iOS device. (In the past, you’d accomplish this via an app that managed the job through AirPlay, which, while workable, didn’t produce video as crisp as the new method.) Telestream has taken advantage of this feature and rolled it into ScreenFlow 5. Now, when you attach a recent model iPhone, iPod touch, or iPad to your Yosemite-running Mac via a Lightning cable, that device becomes a capture source, right along with your Mac’s screen and compatible cameras. As it captures the device’s video, ScreenFlow automatically grabs any audio it plays as well. You won’t see a preview of your device on your Mac’s screen, however. You’ll operate it as you normally would, interacting with the device’s screen. When running Yosemite on your Mac you can now capture video from a compatible iOS device. You’re welcome to combine multiple input sources. 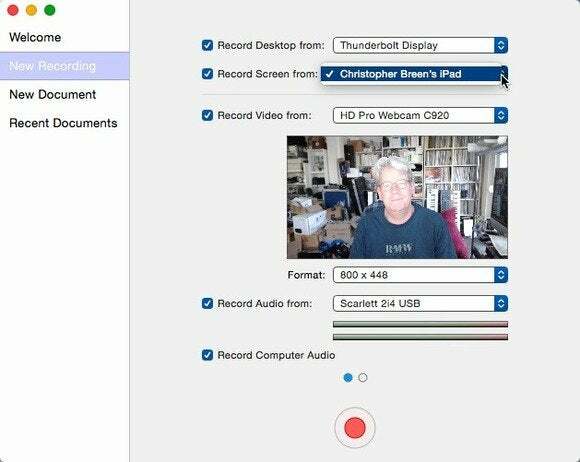 For example, you could choose to capture your iPad, your Mac’s display, narration from a connected microphone, the audio your Mac plays, and video from your Mac’s FaceTime camera or compatible webcam. Most sources are added as separate tracks. Select a video track and you can move and resize its contents in ScreenFlow’s preview window. For example, you might want to move the video captured by your webcam to the top-right corner and make it smaller, place your Mac’s screen capture on the left side of the frame, and scale the iPad’s video so it takes up most of the frame’s right side and slightly overlaps your Mac’s screen. When capturing audio played by my Mac I ran into one significant problem. While the Mac’s audio was captured perfectly as long as I chose the computer’s internal speakers or connected Thunderbolt display as an output destination in the Sound system preference, if I instead chose a USB-connected destination such as my audio interface, the Mac’s sound was distorted and delayed. Telestream is aware of the issue and is working on a fix. ScreenFlow's new Touch Callout pane. Select the video track captured from your iOS device, drag the playhead to the position in the timeline where you’d like to add the callout, and choose Actions > Add Touch Callout. A gray dot appears on the screen that you can drag to a new position. A yellow Touch Callout action is added to the track and the Touch Callout pane appears on the right side of the ScreenFlow window. Within this pane you can choose the number of dots that you’d like to appear, their size, spacing, color, and opacity. You can also create an animation so that the dot moves from one place to another—something you’d do to illustrate a drag or swipe. Adding these callouts would be tedious if not for the fact that ScreenFlow 5 also adds templated actions. This lets you create actions and then save them. For example, you could create and then save a Touch Callout action that illustrates a swipe down. You can later choose that action from the Templates entry in the Actions menu and it will be added to your project, complete with associated animation. Telestream has kindly added a collection of preconfigured Touch Callout actions including Single Tap, Swipe Left, Swipe Right, Zoom In, Zoom out, Four Finger Swipe Left, and Four Finger Swipe Right. Your viewers no longer need guess at what you tapped. My one complaint about the feature is that the callout dots are constrained to a line. That means that I can’t illustrate a four-finger pinch-to-Home-screen gesture as I can’t put four dots on screen in a four-cornered arrangement. If you’ve spend enough time with ScreenFlow you’re accustomed to those “There’s got to be an easier way to do this” moments. For example, you’ve added a video action that zooms in on a particular portion of the screen. Undoing it requires that you add another video action and then reverse the settings from the previous one—zoom out to 100 percent, for instance. ScreenFlow 5 offers a new feature called Snapback Action that, when implemented, adds an action of the same length that undoes the previous action. Using my example, I’d add my zoom action and then, when I want to return to full screen, choose Actions > Add Snapback Action > Video. An “undo-what-you-just-did” action is added to the timeline and ends at the current playhead position. Another time-saver is a the Recording Monitor. Select it from the ScreenFlow menu and you see a preview of what your webcam is capturing along with meters that reflect your audio input gain. This is particularly helpful when you’re using a webcam for a picture-in-picture effect. Far too often you’ve performed your capture and, on playback, discovered that your face is positioned incorrectly or your microphone gain was set too low. Being able to preview each is helpful. If you have two monitors you can keep this preview window open, but “off camera” on the second monitor. If, instead, you leave it on your primary monitor, it will be captured along with everything else on the screen. With the Recording Monitor you can ensure that you're in the shot and your audio levels are okay. ScreenFlow 5 also lets you insert markers—both during recording and as you edit. To do the former you need to set up a hotkey that you can press when you want to mark a point in your capture—perhaps when you want to later remind yourself that you’d like to cut your clip at this point or add an action. This is yet another time saver that allows you to spend less time scrolling through your timeline to find just the perfect edit point. Finally, ScreenFlow 5 has incorporated Apple media browser. If you wish to insert an image from your iPhoto library or a track from iTunes, you can now easily do it. ScreenFlow 5 also introduces a couple of new export features. As I mentioned earlier, ScreenFlow now lets you capture video and audio directly from an iOS device. This makes it possible for iOS developers to create preview movies that they can post at the App Store. Making that job just a bit easier is the new iOS App Preview export setting. Choose it and your movie will be converted using the ProRes 422HQ encoder. In addition, the latest version includes a Batch Export feature that allows you to queue up multiple ScreenFlow documents and export them using the same export preset. If you’ve used ScreenFlow in the past and are accustomed to tweaking its export settings you’ll find that they’re now more limited. To make ScreenFlow 5 available on the Mac App Store, Telestream had to remove any QuickTime export options, as QuickTime has been deprecated by Apple in favor of AV Foundation. QuickTime APIs can no longer be used when submitting apps to the App Store, thus the change. In practice, this means that when you choose the Lossless – ProRes with Alpha preset, your only encoder options are ProRes 422 HQ and ProRes 4444. I’ve been producing screencasts for a long time and spent a number of years doing so with iMovie. I switched to ScreenFlow around the turn of the decade and can’t imagine switching back, particularly now that ScreenFlow 5 supports direct recording from some iOS devices and lets me add callouts to make my actions clearer to the viewer. As you’ve read, I have a couple of quibbles but they pale in comparison to the benefits this app provides. If you’re producing screencasts on your Mac and not using ScreenFlow, it’s high time you did.